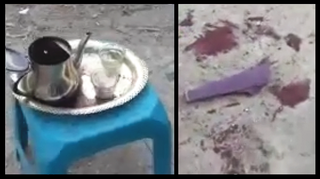 This alleged fighter-jet bombing of a playground, with generally banned cluster munitions, killed a reported 8-11 children (reports vary) on November 25, 2012, in Deir al-Asafir, a suburb of Damascus as they played, some at "tea time" (see inset) in a field (playground). "None of those killed were older than 15 years old," local activist Abu Kassem told Reuters, although at least one adult male can be seen among the apparent dead, and Kassem noted "there are two women among 15 people wounded, mostly hit as they were inside the courtyards of their houses." By other sources, around 40 people were injured to varying degrees. The main issue worth really examining is whether the children we've seen dead in opposition videos were even killed by the cluster bombs shown in the other activist videos, or by something a little more direct than that. Handicap International today denounced the Syrian government's use of cluster bombs in Deir al-Assafeer, a town in northern [sic] Syria. This practice was recently confirmed by Human Rights Watch. [...] According to Human Rights Watch, the weapons were used during bombing raids on the town of Deir al-Assafeer, on Sunday 25 November, killing at least 40 people [sic], including 11 children, and injuring many others. Most likely the coordinates were just off; we can confirm here the field video location - the "playground" - is a perfect match with the spot shown in HRW's image. The inset graphic helps clarify this, with a nearly 180-degree panorama of the view to the west (open in new window for full view). It didn't fit here, but views to the east also match. The time seems to be near, but still shy of, sunset; dense clouds obscure the sun, which is something like 7-15 degrees above the horizon, and somewhere between 230º and 240º from north (sunset should be at about 5:24 pm local time, azimuth 245º, per the NOAA's solar calculator. Rough time estimate: 4:30 PM, +/- 20 minutes, at most two hours after the alleged 2:50 PM bombing. The only notable difference in the scene is the lack of trees/shrubs in the possible grove the cameraman seems to be in, as the satellite imagery shows it (grayed-out a bit in the image here). Instead, it looks like a crater, empty and gritty, with bull-dozed piles on the edges. This clearly predates and has nothing to do with the alleged cluster bomb attack. This would cause numerous small explosions, like a bucket of hand grenades - adequate to tear up people, but not enough concentrated punch to send up masses of earth. The place the dead and injured children were concentrated in that afternoon, as widely seen, is most likely 400 meters west, by the village's central mosque, and that video filmed around 3:00 PM. (see below, "crime scenes"). 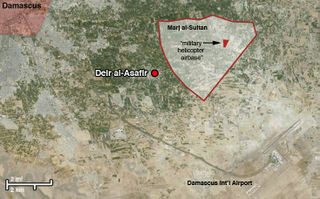 As the inset map shows, the town is immediately west of the Marj al-Sultan district, housing an air force base of the same name, from which the alleged air strike might have originated. However, wikimapia lists only a helicopter base in the military enclave there. Interestingly, the rebels had reportedly conquered this base just before the bombing, by "Sunday morning" according to the Syrian Observatory for Human Rights. A video of the place and the satellite imagery both support that, showing mostly or totally helicopters. The video shows at least two have been destroyed and burned, while, as the BBC reports, "Amateur video emerged showing a rebel standing beside a wrecked helicopter while a man speaking on the video said a warplane had been blown up." It's entirely possible this means nothing but his way of saying helicopter. It's possible the raid was carried out, in part, to provide just such an explanation for the alleged government atrocity planned for that afternoon; just in case the audience didn't quite buy that the bombing was unprovoked and aimed right for civilian, there's a plausible reason to strike a place near which perhaps rebels really were hiding. This creates two narratives, one ready to replace or support the other, that both keep the crime firmly pinned on a rogue government still in charge of its own skies. If a bomb remains can be proven to have been dropped from the sky rather than a pickup truck, that would normally be a 100% sign of government authorship. But perhaps worth considering is that it's not every day such a strike follows the rebel takeover of an air base just a few miles away. Rebels claim they destroyed one warplane there, besides the helicopters. It's conceivable they brought a defected pilot and technicians, armed the old Mig 23 with an old cluster bomb they got wherever, and took it for a very short flight prior to destroying the evidence. Until a jet's presence is proven by anything other than a witness who could be one of the crime's perpetrators, other possibilities remain worth considering. And even if they were dropped, or deployed some less conventional way, some evidence (see below, "bullet bombs?") suggests it wasn't the cluster bombs, but people with guns and maybe other weapons, that killed these children and left their mark in other ways. "Syrian authorities made no [immediate] comment on the report," Reuters' dispatch noted, but passed on the Syrian army's previous assertion that it simply did not have any cluster bombs. It's of course entirely possible that's a lie; one reason not to sign the treaty is if one plans to use cluster bombs someday, which might suggest (or pre-dispose one towards) ownership. However, if they did have and even use them, it would be a moral, not a legal problem; like Israel, the US, and Russia, Syria has never signed the treaty pledging not to use them, when the crime is breaching an agreement to refrain. 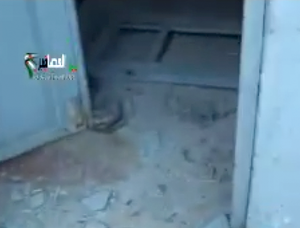 Some extremely similar cluster bomb remnants, but with no visible markings, were in opposition hads in Deir al Asafir as seen on one of their videos, following some alleged strike prior to October 13. A 2004 Identification Guide published by James Madison University's Center for Stabilization and Recovery contains a picture of an RBK-250/275 AO-1SCh dispenser showing the exact same markings as seen in video 2. Acquisition time could have been anytime in the 1970s or even later, but the most likely span, if it's not too early, is prior to October 1973, when Syria and other Arab states we arming for another war with Israel, receiving massive amounts of supplies from the Soviet Union. So it's alleged the Syrian government, perhaps in desparation and running low on supplies, turned these almost-antiques that seem to have an unsurprisingly high rate of non-detonation. Human Rights Watch counted "more than 50 unexploded AO-1SCh bomblet remnants." That seems to be close to what's shown. Considering activists claim to have recovered "more than 70," it seems from this limited sampling that the failure rate of these past-shelf-life weapons was somewhere up to 15% if three bombs were dropped. However old and unreliable the AO-1SCh bomblets were, those that landed near children allegedly had deadly effect a shocking percentage of the time. On the video, a resident who lives next to the field says that at least six children died in the field from the attack: Shahd al-Lahham al-Omar, 4 years old, Mamdouh Shehab, 11, Mohamad al-Shafouni, 11, Roba Youssef al-Ali, 13, and two other unnamed children. According to local residents, a second cluster bomb remnant was found less than 50 meters away from the field and killed four children in a house: Mohamad Bassel al-Lahham, 5, Eman al-Lahham, 12, `Adnan al-Hussein, 7, and `Anoud Mohamad, 12. An old man was also severely wounded. A third cluster bomb remnant was found in the farmland 150 meters from the field where the children were playing. The cluster bomb killed Zeinab Othman, 12, and one of her parents. The family was working in the farmland at the time, a resident said. The cluster bomb attack also killed and maimed cattle grazing in the area. Cluster bombs are not likely to fall on and kill people inside a house. "Found" is specified, and a cool little bomblet, picked up with swift curiosity, might be brought in by one of the kids only to explode during show-and-tell. But they specify that "a second bomb landed on a house less than 50 meters away," and thus killed the people inside. This point seems a bit muddled and confusing. Perhaps these youths were killed inside their home in some other manner. 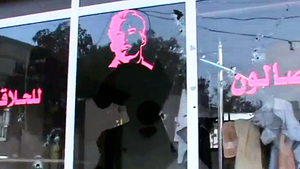 Armed gunmen, for example, don't require that kind of lucky stupidity to get inside. A reliable post-mortem examination could settle the mystery, but such a thing seems unlikely with these rebel-held bodies. What is available is some video footage of some portion of the victims. It's worth a look at least. The videos are available are listed now on the talk page (warning, graphic and/or upsetting content). Distilled notes will be worked in below in time. As noted, those killed in the attack were reported to be mostly or totally young children. There was however at least one man, apparently dead, in dress shoes and slacks, a blue sweater, bloodied from the waist down, behind up and head down, apparently executed there next a heavy truck of some kind, most likely for official use (0:43 in the famous video). As mentioned above by HRW, Zeinab Othman, 12, reportedly died along with one of her parents (unspecified). A possible adult male is laid in front of the hospital type area the wounded are arriving at all at one (0:13 in this video) Otherwise, adults were only reported wounded, whether out in the fields or in their homes. The home behind them seems to be the one that was allegedly hit by the second cluster bomb. As Human Rights Watch explained, citing local residents, "a second cluster bomb remnant was found less than 50 meters away from the field and killed four children in a house," also severely wounding an old man. 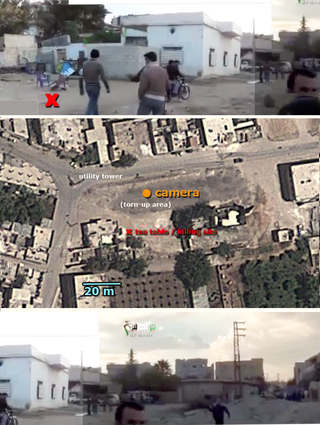 HRW clearly studied this field video, since they identified just that spot in satellite images, and the home they mention might be shown on that same video. If not, this is an unexplained second home hit in the cluster bomb attack, or the given distance is misleading. The parts of the home people were apparently killed in are about 9-10 meters from the blood stains out back; the "playground" is the near half of the home's back yard. Were two cluster bombs with their 300 bomblets dropped on this one home and its backyard? Or was it only one, with the second falling 150 meters away in another field, and the third falling at another home 50 meters away, or elsewhere unknown? Since it's shown on video, this home is worth analyzing. It's not really entered but for the courtyard, which would be just as open to bomblets as the field. It's entered through the back, the east side, after passing the tea party site. The outer wall is marked by low-level round gouges, possibly shrapnel marks. They step through a curtain-covered doorway in the east wall of the courtyard. The camera avoids the left side of the courtyard, panning down the right/north wall. Early in is the only doorway that clearly has a door (see inset). It's pushed open, debris and dust all over, and a damp pink spot that could be blood shed right against the door (if so, however, apparently some hours or even days before the alleged bombing that afternoon). Just inside is a large obstruction, some kind of wooden frame of some weight and length, that could have tried to pin the door closed at one time. The room is a living space, lined with low seating cushions as usual, with possible blood spots on the patterned rug. The roof seems intact, so if this is the home referred to, it's not clear how anyone was killed inside after a bomb fell on it. They're not known to ram down doors to enter homes. Then panning further along the wall, we see damaged food stores; olive oil, it seems, spills across the ground. Just past that spot, it seems that at least one person was killed against the house's outer wall, rather than inside, with a spray of blood and/or shrapnel that should be studied by an expert. This is more consistent with cluster bombs. Some blood is spattered onto the green curtain over another doorway to the west. 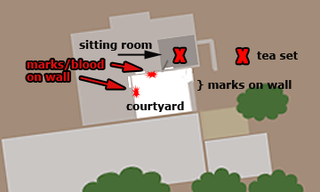 Then, the corner and the next door, into the west part of the home;to its left (south) is a similar spray area, surrounded by other marks that could be from either shrapnel or bullets. There the video cuts, at 2:43, to a cluster bomblet apparently just then found in situ, in a properly sized hole in the concrete somewhere. It's hard to see what forces rammed it through this (fairly thin) concrete - when they usually just fall on their own middling weight - while failing to detonate it (again, these 40-year-old munitions seem to have had a near 85% alleged detonation rate). Incidentally, there are homes about 50 meters away, across the field and north cross the street, that were allegedly damaged by the cluster bombs. At that distance, smaller holes (roughly the size of large anti-aircraft rounds) and larger ones (possibly RPG-sized) are punched in the south-facing walls of at least two buildings. The children were seen carried across and laid on the sidewalk in the famous video, in a different location that hasn't been definitively identified. One likely match in the same town is this spot on Google maps, 400 meters west of the field, across from the central mosque. The scene across the street is consistent (trees behind a long, low wall) and the first 25 seconds of this video shows the courtyard behind the gate from the inside, with details matching this locale. Just watching the famous video, it would almost seem the children were injured nearby and are being put into vehicles to get them help; however, the visual clues suggest this is in front of the hospital/clinic area they're being dropped off at. Why, as this camera and it seems everyone first arrives, the two girls are laying untended on the sidewalk as if simply dumped there would then be unclear, especially as the one in red is in the way; anyone walking in at this time would have to literally step over her (see inset). Several children are shown arriving alive and dead, carried in, or carried somewhere (the camera pans around too much to establish any clear sense of movement). At the very end, the girl in red can be seen just now picked up and held by a stationary man. The less famous view seems to be moments later; the girl in red and black with bloody legs is just now being carried inside (see first frames).The sky seems to have cleared up, casting long shadows suggesting people are walking north/northeast as they enter the courtyard. If the location by the mosque is correct, the street's orientation is 226º. Shadows running almost down it as seen say the time in the second video is between 2:38 and 3:17 PM local time (azimuth range: 220º +/- four degrees). For reference, the bombs were said to fall at about 2:50, the early middle time of that range, suggesting a very swift response by the opposition activists. Others must have already been brought in before the girl in red, as some of those in the first video aren't seen passing by. It seems a few more have arrived, with two other small children carried in after her in a minor rush on the doors. An older girl with some blood on her clothes walks in, with a woman in black behind, face drenched in blood and no apparent effort to wipe it off. A small girl with no sign of injury or blood was somehow brought only this far, but cannot walk the last feet to the door; she's picked up and carried in. A dead man or older boy lies unmoving to the left side of the doors. It's all a strikingly intense scene. The interior isn't shown here, and we can only presume the later video inside a clinic (see below, victims) is the same area. many cigarette butts in the area just outside the gate (possibly old). At 0:35 a piece of plastic of an unusual green, also seen in a tab from something seen next to the blood smear at the killing field (1:54 in the field video). The girl in red lays atop a man's abandoned slippers. A small gathering of four men across the street, possible disagreement of note (0:28 in the famous video). * The rear window of the car with the dead boys in it is missing. There was also one stray video of another site included in Another opposition videoof November 25 showing what the title claims as "اثار القصف بالقنابل العنقوديةعلى قرية دير العصافير" (Google translated: "Effects of bombing Ancodehaly (?) village of Deir sparrows (al Asafir). This seems to be a hair salon or something similar, and is examined below. One of the older boy victims also has what seems to be a small-caliber bullet-hole in his upper forehead. The compilation video shows this close-up at 3:53, after he's been wrapped, though not yet washed. He may also have a more random-seeming and bloody puncture on the bridge of his nose. The other child victims, however, seem unmarked by bullets. This page was last edited on 9 December 2012, at 14:51.